Even when preparing the lunch I am learning about bulbs - I have never observed this phenomenon before. 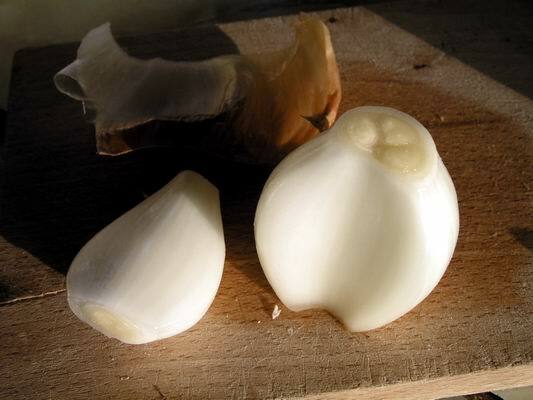 Having chopped off the top and bottom and removed the outer brown skins, I was fascinated to see a second brown skin inside the white layers of the onion bulb. 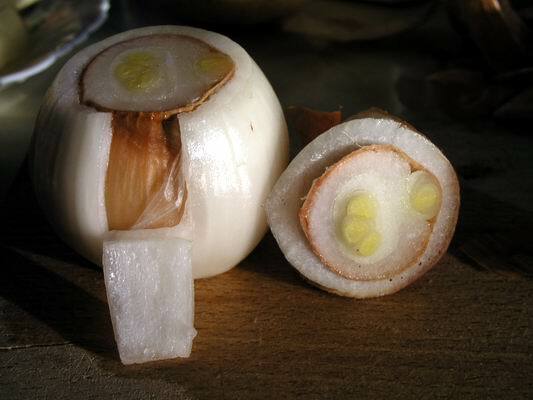 The cut sections show that the bulb was going to put up four growth points. 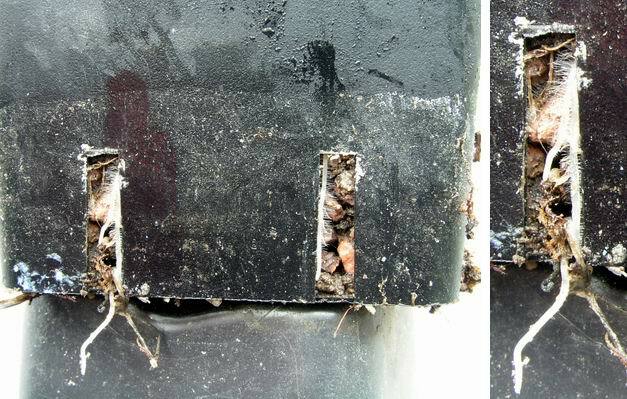 When I removed the second brown skin the bulb split into two with the bigger section having three growth points and the smaller section a single growth. This smaller section would have split off as an independent bulb, had it been allowed to grow on instead of ending up in our lunch. I wonder if all the true bulbs form this skin prior to and as part of the splitting process. Although there are no signs of any top growth in the frits, below the ground their roots are extending and are now coming out of the drainage holes at the bottom of the pot. Notice the masses of fine 'root hairs' that help the plant take up moisture and nutrients- this is why we must not let the compost get too dry or we will damage these roots. 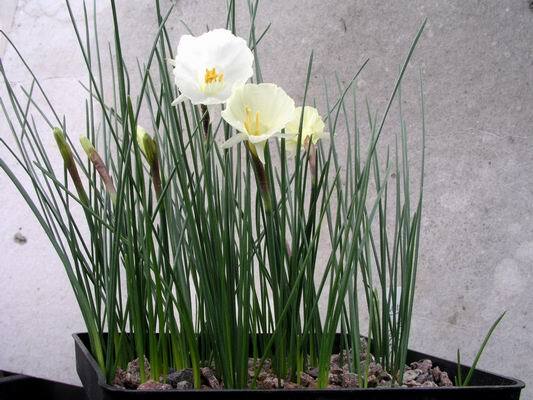 Then the bulbs will not be able to take up the nutrients they require to ensure a good flowering in spring and a nice bulb for next year by the time the plant goes dormant in May/June. I thought I would take a look at the bulb and see what stage of growth the shoot has reached it is making slow growth upwards. 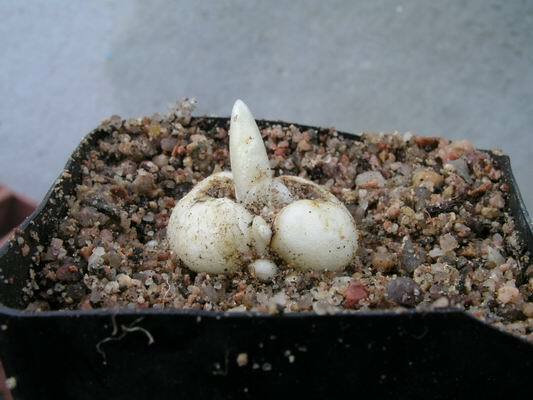 If you feel sorry for my bulbs continually being disturbed so that I can see and photograph the various stages of growth, I will let you into the secret of my method. I cut up two identical pots: on the right I have cut off the bottom third of one pot into which I plant the bulb into our normal potting compost. I cut the flat bottom off of the second pot so I can drop the planted bottom section down into this to reform a pot. I then fill the reformed pot to the top with sand. 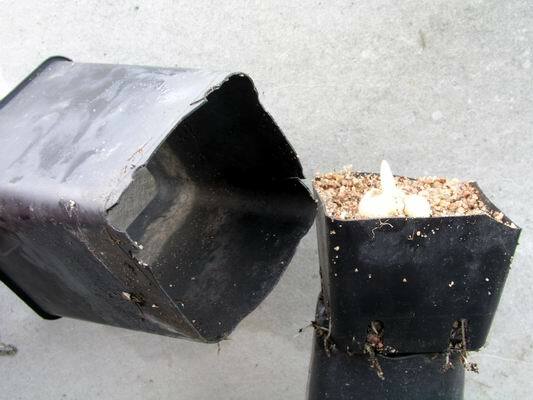 It is then quite easy to tip out the sand and push the bottom section up and out so that I can see the bulb clearly with no disturbance to the roots. 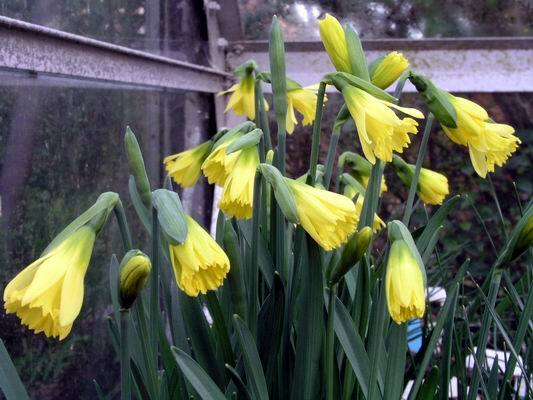 Cold and damp weather are not the best conditions for Narcissus flowers but it creates ideal conditions for moulds such as botrytis. 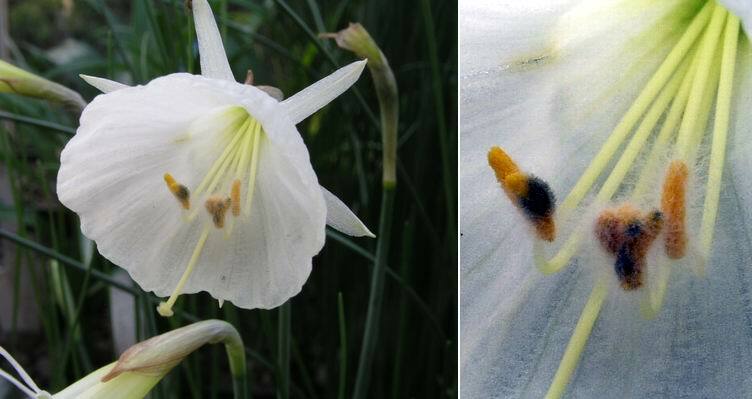 All the flowers of this form of Narcissus cantabricus have mould forming on the anthers. It is interesting that others growing along side are not affected so obviously some individuals are more prone to suffering in our conditions than others. Narcissus 'Cedric Morris' has never suffered in this way with us, it seems to take everything our inclement weather can throw at it. 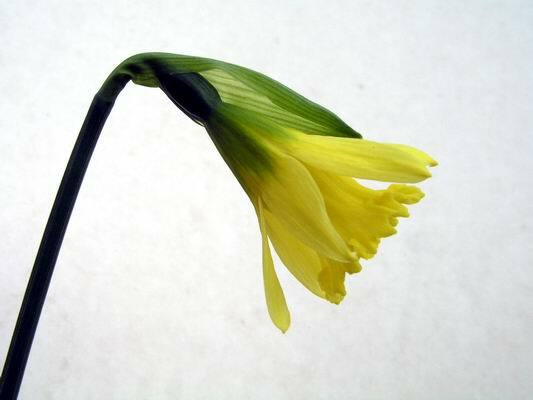 The only way it suffers is that the stems become too tall in our low light levels but this is a small cost to pay for such a delightful wee daffodil. For years I listened to friends from down south telling me that Narcissus 'Cedric Morris' was always in flower with them by Christmas while we had to wait until the end of January before ours opened there enchanting flowers. Gradually ours opened earlier and earlier and by 2003 we also had it flowering by Christmas and now this year the first colour was showing in the first week of December - how the seasons are changing. This was the last pot of Narcissus romieuxii mesatlanticus to be replanted this year and it was not watered until early October, one month after the other pots. As a result the flowers are on much shorter stems which makes it more attractive as they do not flop over so readily as their taller siblings. All the pots that were watered in September have very well developed root system now while this pot has much shorter roots at this stage. I will follow the progress of this pot and see if the root growth can catch up with the others and how the size of the bulbs will compare at the end of the season. To complete this accidental trial I will also have to keep these bulbs separate and compare how well they flower next year. 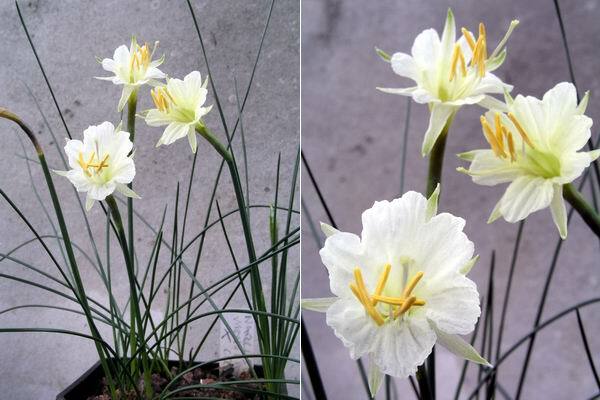 I received this narcissus that I believe was originally raised by Don Stead. I got it labelled N. monophyllus x cream and I think it is a cantabricus x romieuxii hybrid. It is as distinct as the one that I named a few years ago as N.'Don Stead' and if I can get it bulked up enough to distribute, I would like to name it for his wife Joan Stead. It has a very distinctive, almost split, corona with the style and stamens being much exerted and like N. 'Don Stead' its stems stay nice and short even in our low winter light. 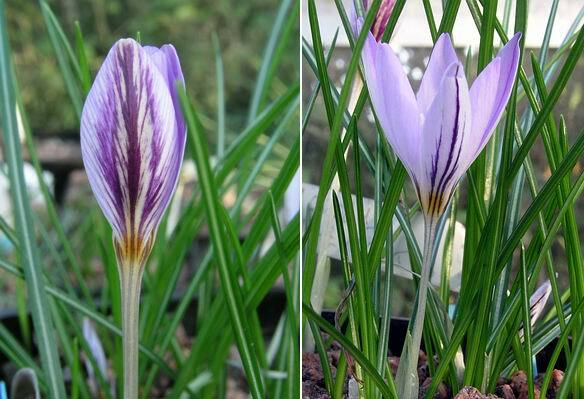 As those of you who visit the forum pages will know, Crocus laevigatus just keeps on flowering. It is one of those species that cannot decide if it is an autumn or spring flowering species and so different forms of it bridges the two and gives us a progression of flowers through out the winter.